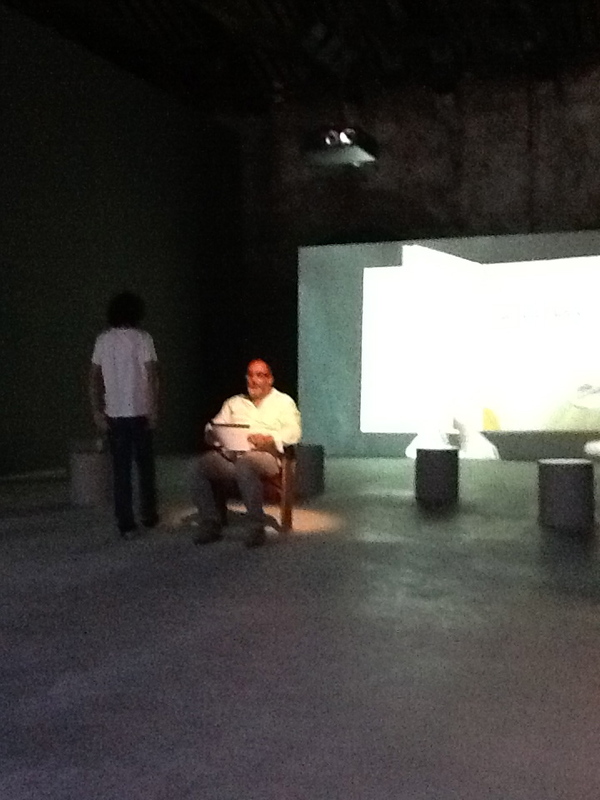 I visit ‘Letter to a Refusing Pilot’, by Akram Zaatri at the Lebanon Pavillion in Venice and I am moved to tears as it stirs up memories and recalls the light and blight of the middle eastern landscape, where we grew up. As one enters a darkened space, a lone old fashioned theatre seat is dimly lit from above, facing a screen with a 16mm film depicting bombings on hilltops. 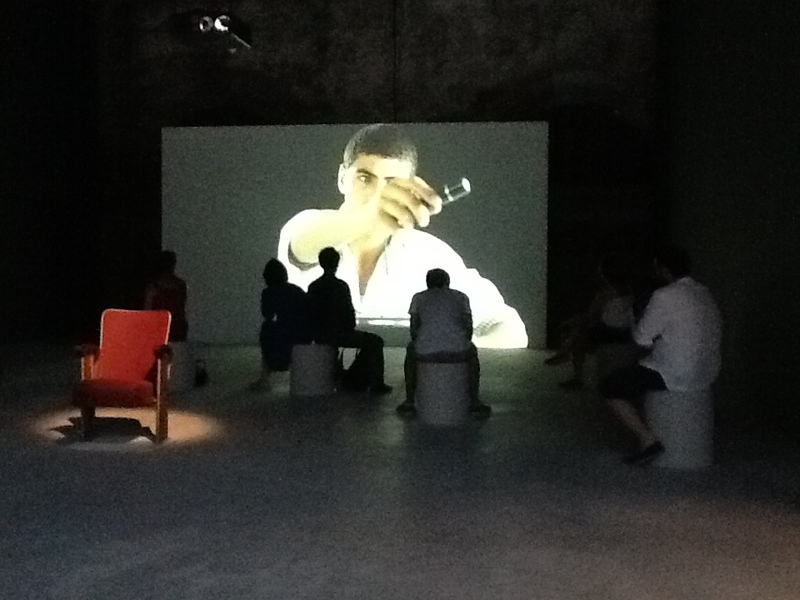 Behind the theatre seat is another screen, which faces the viewer as she approaches the space. Here an HD film is screened, where images alternate and a narrative is masterfully constructed. The viewer is being pulled into the space and must choose which screen to watch. When I visit – I catch possibly a rare instance, whereby a man chooses to sit at the lit old fashioned seat and view the 16mm ‘bombings’ film. His son standing beside him (slightly embarrassed, as children are, by his father’s audacity) and facing the other screen, chooses to watch images which include boys running, school bell ringing and paper planes flying. I stay on and watch both of the films for a long while. I become fascinated with the way people respond and move around. No one else sits down on the lit seat and I realise that the way the additional stools are anchored to the floor – just behind that seat – means that choice is a a crucial player here. Much has already been written on the narrative content of ‘Letter to a Refusing Pilot’. Its focus is a story I think I remember from the days of the first Lebanon War- whereby an Israeli pilot had refused to bomb a building, which being an architect he recognised could only be a school or a hospital. I am not sure now, with hindsight, if it was just a rumour but I do know I was not aware at the time these events unfolded that the pilot was an architect. I do know that he will have been one of very few others, who refused at the time and raised their objections, becoming our heroes. The narrative on the HD film weaves together fact and fiction, art and architecture, sounds and textures along with paper planes and real ones, construction and destruction. Zaatri’s previous preoccupations with archiving and memory are played out and brought vividly to the present, in crisp and poetic imagery. Opposite it – the images of bombs being dropped over Lebanon play over and over are as compelling as they are repelling. 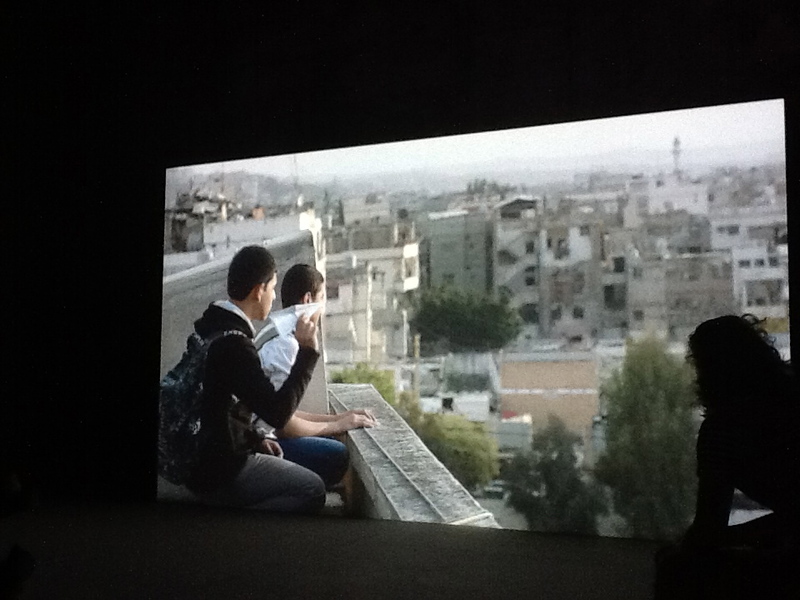 However, what I found particularly striking with ‘Letter to a Refusing Pilot’ (and is as yet uncommented on by reviewers) is less to do with the narrative itself – albeit beautifully constructed – and more to do with the way it is installed, within the space of the Lebanese pavilion, eliciting a choice by the viewer as to which film to watch- the 16mm one- of Israeli bombings of Lebanon in 1982, or the narrative constructed in HD opposite it. Of course many people do watch both- but as far as I can see – and I linger for a long while – never at the same time. One’s eye and soul can only engage with one side of the space at any given time. We are made to choose between the archived past on one side or the story of growing up within the sound and the fury of war. We are made aware that both co exist within the same space but time plays its role too as we have to move around the space to capture as many of the visuals, as we can. Maybe ‘Letter to a Refusing Pilot’ is probing us, offering a subtle and powerful reminder that we have choice, whether we engage with art or with war? ‘Letter to a Refusing Pilot’ makes us realise that war and art do not exclude each other – quite the opposite – as they clearly co-exist in the same space and they echo and reflect on each other. Crucially, it reminds us that we have ‘choice’ – like the refusing pilot. Whether or not we exercise that choice is up to us….